Driving routine: Hybrids are not more efficient for every driver. The technology excels in urban situations and if you frequently travel short distances in stop-and-go traffic, the efficient battery side of the hybrid equation will be fully utilized. This is why the EPA city MPG rating is often higher than the highway number. Suburban commuters with longer runs on combustion power can still enjoy the benefits of a hybrid. While it might be harder to extract spectacular EPA numbers, hybrids are more efficient and the driving experience that includes regularly shifting from battery to gasoline power is now almost seamless. Long haul highway drivers will ultimately be better served by a different MPG improvement technology such as diesel power. Note that driving a hybrid feels different than non-hybrid cars. They are not as quick and they don’t have the same road feel because the emphasis is on fuel economy, not performance. This is improving, but driving routine and habits should be carefully considered before making a purchase. Be sure to test drive in situations that resemble how you actually will use the car. Size: The EPA size classification scheme is not perfect, but it is a useful starting point to make sure that you do not purchase more car than you need. Regardless of the technology under the hood, driving a large SUV when you don’t need one is wasteful. Packaging: Even when you get a sense of the right size, packaging and layout are important factors in making sure that you can use all of the space you have. The current four door hatch arrangement is extremely efficient in terms of usable space and aerodynamics. Price: Hybrids cost more than their combustion counterparts and consumers should accept that they will never recoup the difference in price at the pump; especially with today’s inexpensive fuel. Even if you accept the hybrid premium, price can still be a factor because there are now luxury variants to consider. Rule of thumb; make sure you know how the extra cash is spent. On models that share drivetrains, such as the Chevrolet Tahoe and Cadillac Escalade, the higher pricing buys luxury, features and exclusivity, not better performance. Underneath the hood, they are the same vehicle. On the other hand only a couple of thousand dollars can separate very different solutions and the difference can buy significant performance benefits. Consider the Ford Fusion and Chevrolet Malibu; while the Fusion is more expensive, it is widely considered to be one of the best driving and most sophisticated hybrids on the road. The Malibu’s simpler technology is targeted meet to a specific price point. Know what your extra money is buying. It could be luxury features, performance, or in the case of Toyota’s Highlander versus the Lexus RX 450h, both. Safety: Thanks to federal legislation and consumer demand for safe cars, it is probably fair to say that none of the vehicles listed will cause Ralph Nader to lose sleep. While command seating in a large SUV may feel safer, driver attentiveness is far more significant than vehicle height, weight and the number of airbags. Car purchases are often emotional decisions. Nobody really needs 400 horsepower or air conditioned seats. Nor do we need hybrids to conserve energy. Car pooling, mass transit and planning efficient travel routes saves more fuel than a hybrid used without those practices. Then there is the real cost of hybrids that is hidden beneath EPA numbers and sticker price. Should buyers consider the expense of properly disposing of the battery packs? How about the extra energy involved in making specialized, complex components? 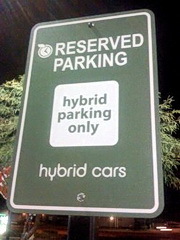 These concerns beg the larger question, do hybrids really save energy and make a difference? Some people believe that the fuel efficient version of the Ford F-150 may have a smaller carbon footprint than a Prius over the dust-to-dust lifecycle of both vehicles. Yet people buy hybrids because they want to feel like they are doing a good thing. Even though the savings at the pump will never be enough to cover the hybrid premium and even though the jury is still out about whether hybrid is the best answer, the emotional appeal is compelling. Perhaps that’s the way it should be because this particular emotional choice along with government regulation is steadily improving the technology. One thing is for certain now, hybrids save gas. In ten years we may be driving worry-free EVs and hybrid buyers can feel good that experience learned from building and driving hybrids helped us get there. That rationale may be enough to help justify the emotional choice to purchase a hybrid today. Nissan Might Make Batteries &amp; EVs In U.S.